Fundamentally, yes. Every material you see is made up of atoms, stuck together by chemical bonds. These bonds are not infinitely strong, so if you put in enough energy, you can break them, and the material will break up. It won’t necessarily melt in a way we are familiar with, but it won’t be solid any more. So, the question is, can fires put out enough heat to break any chemical bond? What we see as a fire is actually a chemical reaction. With a little encouragement, oxygen in the air bonds with whatever material is burning. The oxygen wants to do this so much that it gives off a lot of energy as it does so, and this is the heat that you feel from the fire. The temperature that a fire reaches is limited by how fast the oxygen can get into contact with the burning material. An open, or unenclosed, fire might reach temperatures of around 1000°C, and a Bunsen burner flame, optimised to get as much oxygen to the fire as possible, can reach 1100°C. The absolute maximum temperatures achieved by a fire is around 2000°C, reached in blast furnaces and some welding techniques that attempt to provide absolute ideal conditions for a fire burning with oxygen. The material tantalum hafnium carbide, on the other hand, is believed to have a melting point of 4215°C. We aren’t certain, because the only way to check would be to melt it, and it’s very difficult to reach such a high temperature for any reasonable quantity of material. But it’s clear that a block of this wouldn’t be melting in a fire any time soon! so that means that if I throw salt into a blazing fire, the salt will break down and lose it’s saltiness? Close enough*, it turns into a black powder then disintegrates. *I used aromat to test this theory, which is majority composed of sodium. It’s the next best thing. Yes fire can technically burn anything if its hot enough. Take a lighter for example, The Butane ( A highly flammable liquid) is the fuel, The spark from metal hitting the flint is the ignition and the the oxygen in the air keeps it going. Fire is a very important part of the nature. It is very strong, but you have to respect mother nature. It CANT burn a bible but I wundint do that just being respectful to god and jesus. This answer is quite wrong in many respects. 1. “What we see as a fire is actually a chemical reaction.”. No. There is a lot of technical detail that could be described, but the flame we see is simply hot gas. Usually what we see is the gas after the bulk of the chemical reaction has taken place. 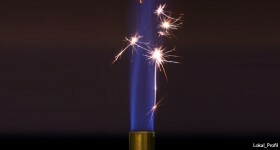 The composition of the gas is still changing from region to region within a flame indicating the reactions are still taking place. 2.The temperature reached by the hot gas depends on the balance between the rate at which energy is put into the gas (from the chemical reactions) and the rate at which it is lost – mainly from radiation. 3. 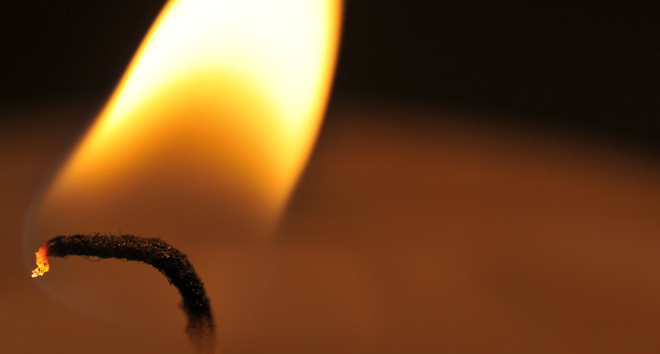 For a candle flame, there are many particles of soot which radiate strongly and keep the flame ‘cool’ at around 1100 °C. That is why we can see the flame and it gives off light. 4. A gas flame on a cooker is not so bright – hence loses less energy and stays hot. It is at about 2000 °C. However if you stick a thermocouple in the flame it will only read about 1300 °C. That is because the temperature of the thermocouple is a balance between the heat input from the flame, and the heat lost by radiation. The thermocouple glows brightly when it gets hot and the energy lost increase as the T to the power 4. So a 50 % increase in temperature leads to a 500% increase in radiative power loss. So its not reliable to measure the temperature of flames with a thermocouple. 5. The hottest flames are probably hydrogen-oxygen flames which reach a little under 3000 °C. 6. To get hotter than this you would probably melt something in an ‘arc’ i.e. pass a very large electric current through it. Not sure what the temperatures reached are – but the key thing is the power. The temperature reached depends on the balance between the rate at which energy is input and the rate at which it radiates. Using large electric currents it is possible to have very high heating rates. 7. Temperatures in explosions can transiently reach very high levels – up to 7000 °C. So can fire melt rock? Where do you think you get magma from??? Which chemical can’t burn by fire and which chemical freeze in oven. I know this sounds a bit weird but what happens if a flame with temperature of around 2000°C goes against magma with a temperature of 1600°C ?